How was your week? Mine has been a mixture of everything: wonderful moments (visiting our dear friends in Las Vegas for a long weekend) and busy moments (having to catch up with all my papers to grade). But each day I have seen that I have been given more grace than what I’d have ever expected. God is good. We are now in chapter five (half way through our book! ), a chapter that mainly deals with three issues: being productive, financial responsibility, and living in community. 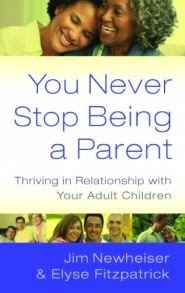 In this chapter the authors stir us up to consider how are we to live in community in our homes with our adult children when they are staying home for a season and for the good reasons. Newheiser warns us that “we might be tempted to micromanage their day or fly off the handle…” I agree. And even through distance, even if our children are off in college, we may face this same temptation because we are only a “text away” from them. 1. Develop an open friendship with your children, so that they will be open to hearing our wise counsel when they ask for it (p.71). Maybe you can review your notes on chapter one as this was an important principle Newheiser laid clearly at the beginning of the book. 4. Young adults living at home should do an adult share of the housework (p.74). We have seen -and heard- this many times: children demanding to be respected and treated as adults but at the same time don’t want the full package of what it means being an adult. They want the privileges only but not the responsibilities. 6. Nothing is more important for living in community with others than trust (p.77). 7. Failure to meet expectations must result in consequences (p.78). I have found through many conversations with friends that trying to avoid the consequences we, parents, find ourselves tempted to overlook the lack of meeting of the expectations we have established beforehand. We are may times so much like Eli. We forget that God cannot be mocked, sooner or later the consequences of all our sins will come. 7. Get good, godly counsel from your pastor or trusted friend and cry out to God for the courage to do the best, most loving thing for your young adult (p.81). I purposely left out the point in which the author says that, forcing or not an adult child living at home to go to church is a matter of personal conscience on the part of the parents. And I did so because I think that in this particular issue, the godly counsel of the pastor would always be necessary. May God give us grace to parent well each one of our children through all the different seasons of their lives. This entry was posted in Being a Mom, Books, Daily Life, Daughters, Elise_Fitzpatrick, Grow_Build_Edify, Newheiser, Sons by Becky Pliego. Bookmark the permalink.